Danielle and I went to Rockburn Branch Park today to throw a ball around and maybe ride bike. We ended up not riding bike because we didn’t like the trail too much and my water bottle holder came loose from my bike. So we grabbed our gloves and brand new baseballs (we lost our previous ball in the woods behind our house) and went out to an empty baseball field. The fact that we had a frisbee was simply due to the fact that Danielle threw it into the bag. I certainly hadn’t intended to play frisbee. It was so awesome to have a whole baseball field to ourselves. It did, at the same time, feel a bit weird to have that whole field to ourselves. It was great to just run around and throw the ball. Eventually our catching hands got really sore from having the ball slam into it. We tried our best to get the ball to end up in the part that didn’t contain our fingers or palms, but it wasn’t always easy. 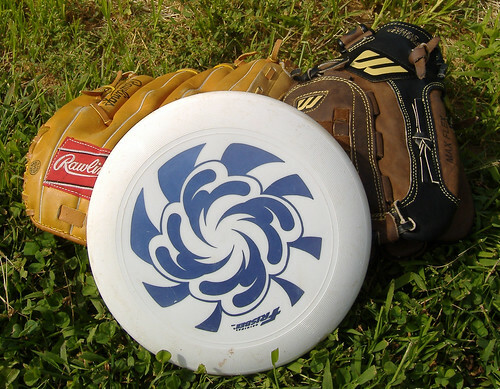 So I looked into the bag and we eventually switch to frisbee. It was so much fun. We were both uncannily good. I think it was mostly because we didn’t have the pressure of really awesome players to make fun of us when we did fling the disc in very wrong directions. Eventually the bugs were getting to be too much and we left. Still, yesterday’s play at the park made the weekend for me. I always support tossing a baseball around!